Danceroom Spectroscopy (dS) is "part video game, part science visualization, part art installation, and part social experiment." dS is a project supported by Bristol University, EPRSC and the Pervasive Media Studios. Understanding the fundamental patterns and rules that govern what matter does on the nanoscale requires insight into the strange frontier-world where classical mechanics is just starting to fade out, and quantum mechanics is just starting to kick in. On top of this, nano-systems tend to involve LOTS of atoms and molecules, with each one affecting every other one. For those attempting to fundamentally understand and predict nano-scale behavior, it gets complicated in a hurry. Scientists dont really know what the nanoscale world looks like, but they’re obsessed with making representations anyway, whether it’s in terms of balls and sticks, blobs, terraces, cavities, ribbons, sheets, etc..
danceroom Spectroscopy (dS) is a new attempt at visualizing the nano-world, but with a twist. It puts us in the picture. People can literally step into, wander through, and interact with the nano-world. dS invites you to move, observe, play, and even dance. 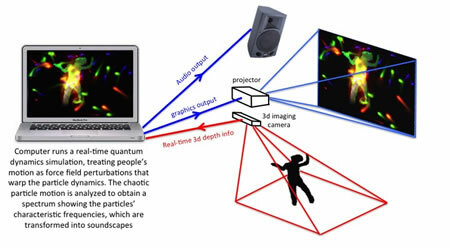 Using cutting edge 3d imaging, real-time computing, and rigorous physics, dS transforms you into a real-time energy field, which in turn warps the particle dynamics of a simulated nano-world. It’s similar to the effect of a pebble dropped into a pool of water – only the pebbles get to watch themselves and the complex ripples and waves they create as they trigger sound and image to generate interactive visuals and soundscapes. ...he found a coley group, all blue-skin makeup and feathers in their hair, not playing instruments but moving among invisible columns of weak microwaves and provoking disturbances which a computer translated into sound... hopefully, music. They were stiff and their coordination was lousy. His own amateur group, composed of kids fresh out of high school, was better at keeping the key and homing in on the tonal chord. From Danceroom Spectroscopy via Spark Salon.